Cities played a key role scaling up climate change solutions and building momentum for climate action at Tuesday’s UN Climate Summit. 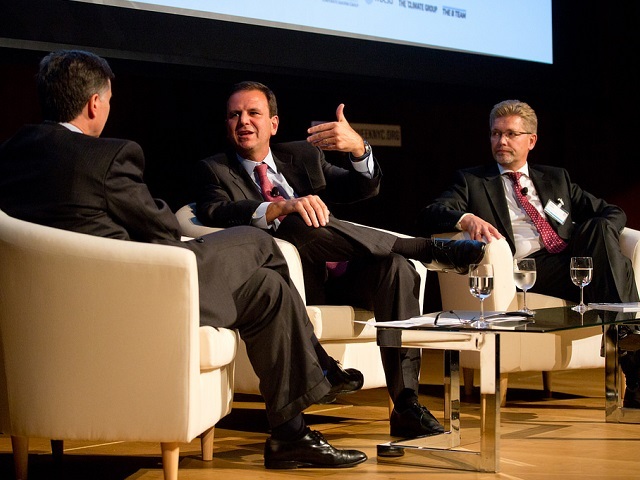 Pictured: Rio de Janeiro Mayor and Chair of the C40 Cities Climate Leadership Group Eduardo Paes. Photo by Juliana Swenson/Flickr. Tuesday’s U.N. Climate Summit included unprecedented focus on cities and the transport sector at climate change conferences. City leaders committed to new actions to promote sustainable urban development and low carbon transport systems. Notable leaders at the Summit included Seoul Mayor Park Won-soon, Rio de Janeiro Mayor and Chair of the C40 Cities Climate Leadership Group Eduardo Paes, United Nations Special Envoy on Cities and Climate Change Michael Bloomberg, and Paris Mayor Anne Hidalgo – whose city will host the COP 21 climate negotiations in 2015. Leaders demonstrated their understanding that the impacts of climate change are real and costly, and that economic growth and climate action can go hand-in-hand. Marches around the world provided a clear mandate for national leaders to stay engaged all the way to the Paris Summit in December 2015 and the Habitat III Conference in 2016. While the outcomes from the Summit are still evolving, here’s an initial look at progress made and next steps. Tuesday’s events reinforced that the fight against climate change cannot be won without addressing our urbanizing world. To this end, the newly launched Compact of Mayors initiative aims to consolidate and amplify cities’ commitments to reduce emissions using a common method of measuring and reporting emissions, the Global Protocol for Community-Scale Emissions (GPC). The strong presence of mayors at the Summit shows city leaders’ commitment to the cause. Their action is backed by new analysis showing that more than 200 cities with existing voluntary emissions-reduction commitments are already on track to reduce emissions by 454 megatons by 2020. The winners of the C40 City Climate Leadership Awards, announced the day before the Summit, demonstrate some of the ways cities are using innovative solutions to become more sustainable – including measures to improve building efficiency, waste management, and resiliency. Also in the lead up to the Summit, New York City Mayor Bill de Blasio pledged to reduce greenhouse gas (GHG) emissions by 80% by 2050 from 2005 levels. Cities’ climate actions are encouraging, given that cities currently emit 70% of global greenhouse gases. The International Union of Railways (UIC) launched the Low-Carbon Sustainable Rail Transport Challenge to increase rail use for freight transport, meet efficiency targets, and reduce emissions by 75% by 2050. More than 110 public transport groups made commitments leading up the Summit under the International Association of Public Transport (UITP) Declaration on Climate Leadership. UITP’s objective is to double the market share of public transport around the world by 2025. The Urban Electric Mobility Initiative (UEMI), with the support of a number of private companies, aims to increase the number of electric vehicles sold annually in cities to at least 30% of all new vehicles by 2030. On top of saving one gigaton of carbon by 2050, estimates revealed at the Summit suggest that the shift to low-carbon mobility catalyzed on Tuesday could save governments, companies, and individuals $70 trillion. There are also new efforts to unlock the finance necessary to increase investments in low-carbon urban infrastructure. Tuesday’s launch of the City Climate Finance Leadership Alliance aims to catalyze new investments to fill the financial gap. So far, signatories include the World Resources Institute (WRI), the World Bank, UN-Habitat, Citibank, Bank of America, Bank of West Africa, Japan International Cooperation Agency, the United States Government, and the Agence Française de Dévelopment. Green Bonds and Climate Bonds – an expanding asset class that raise finance for climate change solutions – also gained momentum on Tuesday, as major investors, issuers and development banks committed to grow the market for these financing instruments. These vehicles are particularly important for transitioning cities to low-carbon transport systems, as the transport sector currently accounts for about 70% of all climate-themed bonds. The use of these bonds has been growing rapidly. In 2011, less than $5 billion of Green Bonds were issued. They grew to over $10 billion in 2013, and are expected to exceed $40 billion this year, with another $100 billion next year. It is clear that cities are, at last, firmly on the climate change agenda. Announcements of important new partnerships, financial pledges, and commitments by city leaders set the foundation for greater ambition for climate action. There is still more work to do, however – particularly in helping cities avoid future urban sprawl. In addition to reducing GHG emissions, climate actions can also help cities achieve development objectives by creating multiple economic and social benefits. For instance, connected, compact cities could save $3 trillion in infrastructure investments over the next 15 years while also curbing global climate change. Of course these commitments are only the beginning – the next step is for business actors and governments at all levels to follow through and implement the actions announced. Local leaders play a substantial role to fill the emissions gap, providing national governments confidence to act. Governments must now harness this momentum ahead of COP 20 in Lima, the COP 21 in Paris and the Habitat III Conference on Housing and Sustainable Urban Development in 2016. A version of this article was originally published on WRI’s Insights blog, along with additional analysis of the Climate Summit outcomes in forests, finance, business, and more.